Colonyhouse is one of the best-kept secrets of the Northwest writing community. From the road, the house looks like an attractive but modest beach home. On the inside, you find the work of the 1930s architectural artists who created Oregon’s classic Timberline Lodge on Mount Hood. Whether you want to work alone on a project, share the house with a group of friends, or participate in a writers’ workshop, you’ll find the beautiful log construction and quaint details a boon to creativity and focus. From the windows you can see Lake Lytle and the forested Coast Range to the east and the thundering Pacific to the west. Occasionally, in the afternoon, the Oregon Coast Scenic Railway train goes by with passengers waving friendly greetings as they pass. Less than a half-block away is a sandy beach, where you can walk for miles and back. From the house, you can walk to the beach town of Rockaway Beach, where you’ll find restaurants, a grocery store, coffee and gift shops, and a fine fish market. Oregon Writers Colony offers members access to the Colonyhouse, a wonderful house with a log cabin interior. 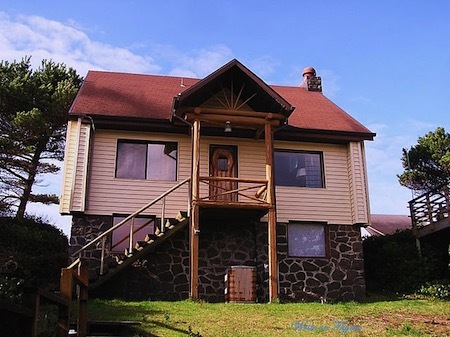 Colonyhouse is located in Rockaway Beach and affords spectacular views of the Oregon coast. Members of Oregon Writers Colony may reserve the Colonyhouse for individual or group retreats. The house sleeps eight people comfortably in four bedrooms, with two full baths. Each bedroom offers individual writing space. On the main floor of the house is a well-equipped kitchen, a big dining table, a large living room with comfy chairs and a big stone fireplace, and a sunny enclosed porch overlooking the ocean. The house has wi-fi and a small printer. The house hosts frequent writing workshops and retreats and is also available for weekend and weekday writing use by Oregon Writers Colony members. Founding members of Oregon Writers Colony bought the three-story log house in 1988. What is now Colonyhouse was built in 1936 by John Steiner, son of Henry Steiner, who with sons John and Henry later worked on Timberline Lodge on Mount Hood. The Steiners built a number of cabins in Oregon in the 1920s and ’30s. 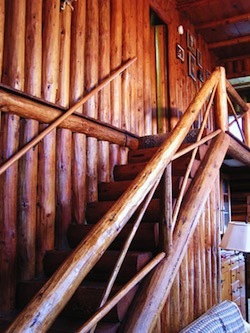 The hallmarks of a Steiner cabin include hand-cut and peeled logs, porches supported by forked trees, large fireplaces crafted from glacier or river rock, stair rails fashioned from naturally curved logs, and doorknobs and shelves carved from roots or uniquely shaped branches. The Colonyhouse is a stunning example of John Steiner’s Pacific Northwest craftsmanship. As a member of Oregon Writers Colony, you may reserve the house for private use or sign up for one of the Writers’ Weekends or other workshops. The house is not available for use by the general public. Learn more about Using Colonyhouse or contact Marlene Howard for more information.